On June 9, 2010 I realized something was wrong with my two week old baby boy Tristan, but it was nothing like I thought. I was on the phone with my husband explaining to him I thought our son was sick because he wasn't eating and was fussy(this baby is abnormal doesnt cry) when i heard a knock at the door. When I answered , It was a woman who explained she was a nurse from my insurance who was dropping in to do a newborn check up on my son. We had never made an appointment and i was tempted to turn her away but something told me not to. She did the routine questions, weighing baby , and then checking his heart. After listening for two minutes she informs me she cannot count the heartbeat and I should take him to the hospital. When me and my husband arrived at the hospital we really didnt think anything serious was going on. The nurse checked his heart and as she did you see her eyes go from calm to horrified and she just gets up and runs to the back. When she comes back she tells me to grab my stuff and hurry because we need to go to a room now. Our daughter was at the hospital with us and they told us to leave her with one of the staff members. When we arrived in our room 10 or more doctors came into the room crowding and shouting around our baby. No one had yet explained to us what was even going on. Soon they informed us we were being sent up to the cardiac intensive care unit. They put us in a tiny private waiting room and we sat there for over an hour before we knew anything. When the doctor came in he informed us our sons heart was failing and may go into cardiac arrest. This was due to the fact that his heart was beating way too fast. A normal HR for a baby is 160 and his was at a 290. They had to determine if his heart was beating fast from a bad rhythm in the heart or if he had a bad rhythm from the fast beating. His heart wasnt squeezing good and he was very sick. They did get his heart to slow down. 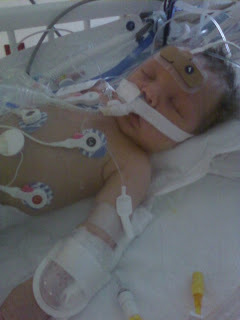 When we finally got to see our baby he was hooked up to so many machines and he looked so hopeless. They informed us the had to shock him due to another episode of the fast heartbeat which the soon told us was called SVT (super ventricular tachacardia). The only thing keeping us calm at this point was our faith in the Lord and knowing whatever happens he is with us. Two days later we are informed that he is making progress and his bad rhythm was caused from the fast HR. 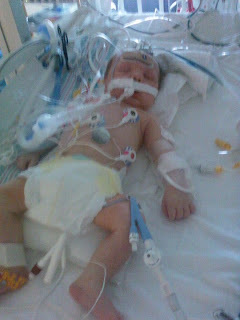 Our son was put on one medicine and was sent home a week later. The doctor told us that he was very scared for tristans life and was so happy he is ok now. We were to check his HR everyday twice a day. Two weeks later he went into SVT again. At this hosptial stay the doctor added another medicine and we went home. We were back two days later. They changed his dosage and told us that he may need to have surgery when he is 8 years old if it doesnt go away but for now they were hoping the medicine would keep everything under control. Two months later me and my husband were checking my sons HR and we discovered his HR was way too low this time ( like 60 beats a minute). The doctor told us not to bring him in until tomorrow but we did anyway.. It was a good thing we did because they said he wouldnt have made it until the morning. His new medicine was apparently poisioning him and was causing an irregular rhythm. The doctors had decided to take him off medicine completly and to just see what happens... Tristan has been off medicine for two months now and so far no SVT. PRAISE THE LORD! We are still checking him regularly and praying that he is healed and wont have to have the surgery or have to go back on medicine. Thank you family and friends who were there for us through this hard time in our life. And thank the Lord for sending the nurse to tell us something was wrong with our baby.